41. 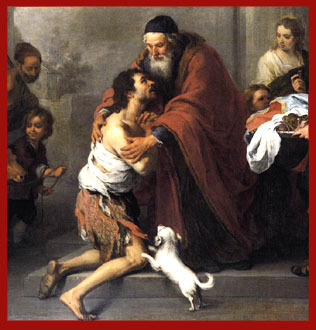 When the penitent comes to confess his sins, the priest welcomes him warmly and greets him with kindness. 42. Then the penitent makes the sign of the cross which the priest may make also. 43. Then the priest may read or say from memory a text of Scripture which proclaims God’s mercy and calls man to conversion. A reading may also be chosen from those given in nos. 72- 83 and 101-201 for the reconciliation of several penitents. The priest and penitent may choose other readings from scripture. 44. Where it is the custom, the penitent says a general formula for confession (for example, I confess to almighty God) before he confesses his sins. The priest should make sure that he adapts his counsel to the penitent’s circumstances. God, the Father of mercies, through the death and resurrection of his Son has reconciled the world to himself and sent the Holy Spirit among us for the forgiveness of sins; through the ministry of the Church may God give you pardon and peace, and I absolve you from your sins in the name † of the Father, and of the Son, and of the Holy Spirit. 67. Ezekiel 33:11: The Lord does not wish the sinner to die but to turn back to him and live. .Come before him with trust in his mercy. 68. Luke 5:32: May the Lord Jesus welcome you. He came to call sinners, not the just. Have confidence in him. 69. May the grace of the Holy Spirit fill your heart with light, that you may confess your sins with loving trust and come to know that God is merciful. 70.May the Lord be in your heart and help you to confess your sins with true sorrow. 71. 1 John 2:1-2: If you have sinned, do not lose heart. We have Jesus Christ to plead for us with the Father: he is the Holy One, the atonement for our sins and for the sins of the whole world. 84. A reading may also be chosen from those given in nos. 101-201 for the reconciliation of several penitents. The priest and penitent may choose other readings from scripture. 85. Psalm 25:6-7: Remember, Lord, your compassion and mercy which you showed long ago. Do not recall the sins and failings of my youth. In your mercy remember me, Lord, because of your goodness. 86. Psalm 50:4-5: Wash me from my guilt and cleanse me of my sin. I acknowledge my offense; my sin is before me always. and am not worthy to be called your son. Be merciful to me, a sinner. 89. Lord Jesus, you opened the eyes of the blind, healed the sick, forgave the sinful woman, and after Peter’s denial confirmed him in your love. Listen to my prayer: forgive all my sins, renew your love in my heart, help me to live in perfect unity with my fellow Christians that I may proclaim your saving power to all the world. 90. Lord Jesus, you chose to be called the friend of sinners. By your saving death and resurrection free me from my sins. May your peace take root in my heart and bring forth a harvest of love, holiness, and truth. 91. Lord Jesus Christ, you are the Lamb of God; you take away the sins of the world. Through the grace of the Holy Spirit restore me to friendship with your Father, cleanse me from every stain of sin in the blood you shed for me, and raise me to new life for the glory of your name. 92. Lord God, in your goodness have mercy on me: do not look on my sins, but take away all my guilt. Create in me a clean heart and renew within me an upright spirit. Or: Lord Jesus, Son of God, have mercy on me, a sinner. Or: The Lord has freed you from sin. May he bring you safely to his kingdom in heaven. Glory to him for ever. Or: Blessed are those whose sins have been forgiven, whose evil deeds have been forgotten. Rejoice in the Lord, and go in peace. Or: Go in peace, and proclaim to the world the wonderful works of God, who has brought you salvation. xcxxcxxc F ” “ This Webpage was created for a workshop held at Saint Andrew's Abbey, Valyermo, California in 2005....x.... ’ “”.